We were asked to design a new logo and build a new WordPress website for a new secure self storage facility based in Nenagh in Co Tipperary, suitable domestic and commercial storage. 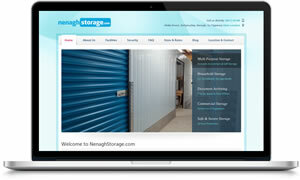 This is the first storage facility of its kind in and around Nenagh and the client was keen to have a website that not only looked fresh, but was easy to navigate and had CMS functionality allowing quick editing and publishing of new articles in the site Blog. We also designed a new company logo and included a number of SEO features within the website aimed at ensuring strong Google search engine visibility. William Jones is the owner of Munsterweb - an affordable web design and online marketing firm which specialises in getting small businesses in Ireland found online. You can find him on Google+ and Twitter. Sign up to receive details of Special Offers before anyone else.